Ghostbusters 2009 (or just Ghostbusters for the rest of this post) was in development for several years and went through different publishers. With backing from the original actors (both Harold and Dan wrote and starred in it), the game was designed to continue the story of the original two movies. Playing as an unnamed rookie, you’re the POV character when another haunting attacks New York. 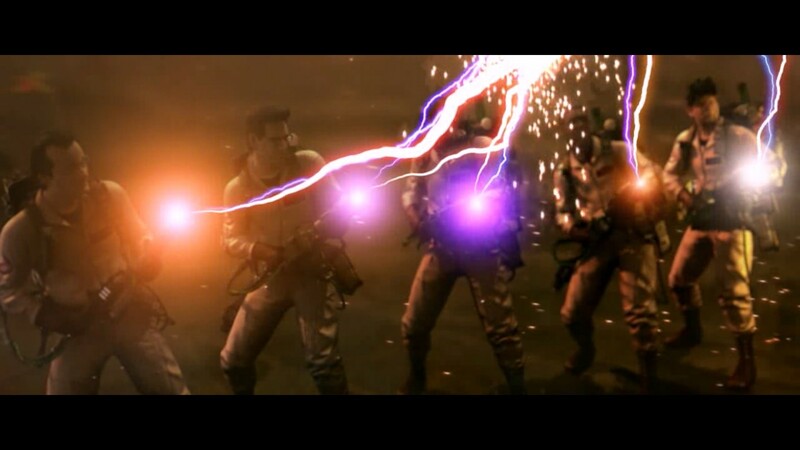 Each stage has you teaming up with between one and three of the other Ghostbusters to bust ghosts. From a story point of view, Ghostbusters does a good job of expanding the mythos set by Dan and Harold with the first movie — supposedly adding in plot points that were cut from the original. The attention to detail showed a level of care — with every item, upgrade, and enemy having lore attached to it. All this would be for naught if the gameplay couldn’t keep up, and Ghostbusters gave us the best busting action last seen in the Luigi’s Mansion series. Ghostbusters starts out with the basic concept seen in the original movie, but quickly expands things out with new devices. As the rookie, it was the player’s job to make use of the experimental tech that the team came up with; as another great detail, the other Ghostbusters would get upgraded in the following area. Enemies were split between ghosts that had to be caught, and objects possessed that needed to be destroyed. Over the course of playing the game, you will get four different weapon types with their own alternative fire mode. As a brilliant point of UI design, the developers turned the Proton pack into the UI for the player. Using weapons would cause the pack to overheat; requiring the player to manually cool it or let it cool naturally. When fighting ghosts, the player had to weaken them with their attacks before attempting to capture them in a trap. Combat was a chaotic scene — with proton streams and ghost going every which way. The team AI for the most part worked, as your fellow Ghostbusters would target the enemy and attempt to capture them. With that said, the game had some design and budget limitations I felt that did ultimately hurt the product. Ghostbusters went through multiple publishers and I’m assuming delays, and there were some rough spots in the design that could have been because of it. The quality of the levels gets noticeably less as you enter the back quarter of the game. You’ll find yourself wandering around large areas repeating the same ghost fights with minimal involvement from the other Ghostbusters. Several plot points and explanations just seem to appear out of nowhere. There were rumors of a supposed character creator to allow people to design their own Ghostbusters which was most likely cut due to budget reasons. While the party AI was smart enough to fight the other ghosts, they were helpless when it came to dodging. 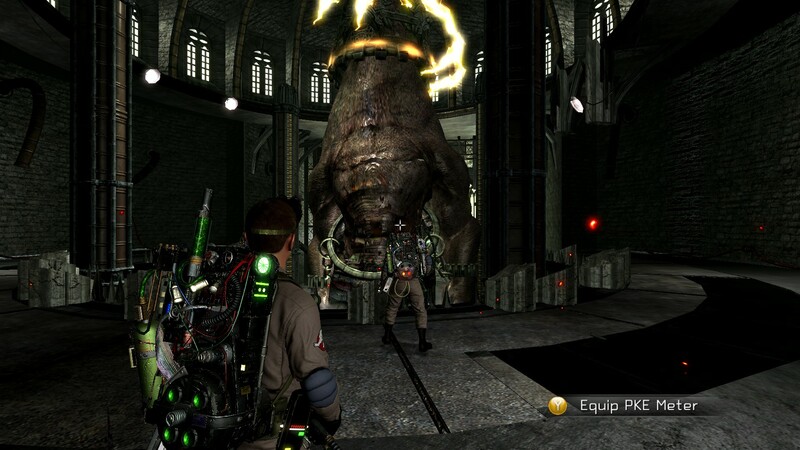 During the game’s boss fights, the Ghostbusters would just run at the giant creature and stand there while they would get hammered by the enemy’s attacks. When someone runs out of health, it’s up to the other teammates to get them up. Unfortunately, the AI prioritizes combat instead of support; forcing the player to get the teammates up or be left alone. The game hinted at the idea of the player being charged for the amount of destruction they caused in each level. I’m assuming that there was more to this idea that was left on the cutting room floor, because the game never mentions it beyond just the opening explanation. The real kicker, and in my opinion could have elevated this game to the top of the charts, would have been multiplayer. 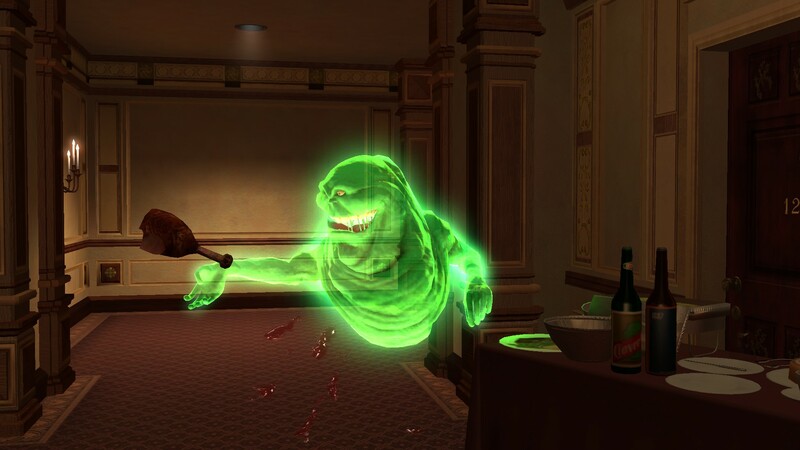 Ghostbusters troubled development could also be seen in the different versions of the game. When we look back, there were technically four different versions of the game released across the platforms. The PS3 and 360 got the most complete version — with achievements and a persistent co-op multiplayer mode. The Wii and earlier consoles got the “cartoon version” with a more animated look and feel. However, they did feature a full co-op play of the campaign. The handhelds got a completely different version of the game in the form of an isometric shooter. Finally, the PC version eventually had the best playing from a technical standpoint, but the achievements and all multiplayer modes were cut. Also, the original PC release was criticized for bugs and DRM at launch. This is where I felt the concept of Ghostbusters fumbled, as the entire game was clearly designed around multiplayer-based gameplay. From how players had to work with their team to keep everyone up, to supporting someone while they were capturing a ghost. There was a lot of potential here to create the next great co-op multiplayer like Left 4 Dead. Ghostbusters, despite being released for the 20th anniversary of the original movie, came out at the wrong time in my opinion. 2009 belonged to Rocksteady and Batman Arkham Asylum with another game that would be remembered as the turning point for IP licensed titles. Following the release of the game, and despite getting rave reviews, Terminal Velocity closed down despite wanting to work on a sequel. 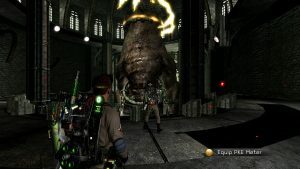 At the end of the game, the developers teased the idea of letting the player run their own Ghostbusters agency in a different city for the sequel. As both a fan of multi-system design and Ghostbusters, the fact that we may never see this kind of design continues to feel like a punch in the gut to me. What Ghostbusters got right easily outweighs any issues with the design, and Terminal Reality deserves to be remembered for creating one of the best movie licensed games out there, and arguably the better sequel to the original movie. As a final point, despite the love of the franchise and concept, there are very few games that tried to put their own spin on busting. The closest I’ve seen was GhostControl INC, but can you think of any other ones?